Please join us from November 6 through November 10 at Valley Spirit Wellness Center in Washington, CT, for a very special event. His Eminence 7th Kundrol Namkha Thinley Wangyal Rinpoche along with Bon Buddhist Geshes from the Tibetan Yungdrung Bon Monastery of Menri in India and Triten Norbutse Monastery in Nepal will create the sand mandala of The Accomplishment of Longevity of Drenpa Namkha for the first time in the United States. In addition, on November 9, H.E. Kundrol Rinpoche will bestow the blessings of the long-life empowerment of the Great Lama Drenpa Namkha and on Saturday, November 10, the Geshes will perform the Sipe Gyalmo Cham dance followed by a ceremony to dissolve the mandala. 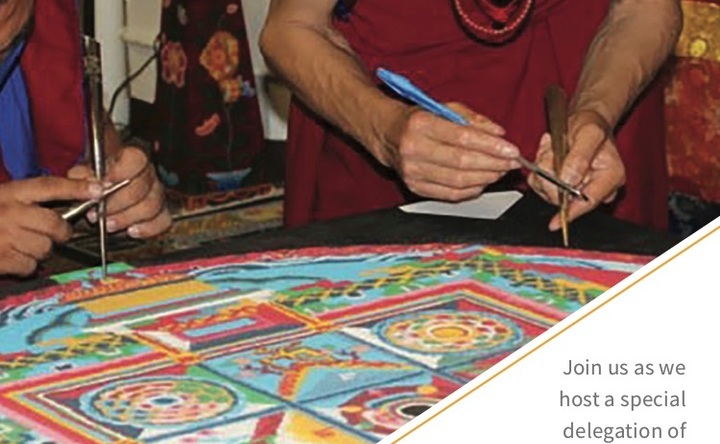 November 6 - 8: The center will be open to the public for viewing the Geshes as they work to create the mandala. November 9: The Long Life Empowerment of Drenpa Namkha will be bestowed by H.E. Kundrol Rinpoche - *Please note that registration will be required for this day. November 10: Sipe Gyalmo Cham dance and the ceremony to dissolve the mandala will be open to the public. We hope you’ll join us for this amazing event and the opportunity to learn more about Yungdrung Bon and the ancient art form/ritual of mandala creation. Please feel free to share this event with anyone who you think may be interested.